Fr Ron is our priest-in-charge at St John. Ron and his beautiful daughter Sarah performed a benefit concert with the proceeds from the admission charge going to help rebuild St Matthew's Episcopal Church in Houma, Louisiana. 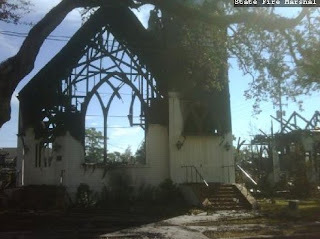 The church was destroyed by fire last year, and the congregation is raising funds to rebuild. 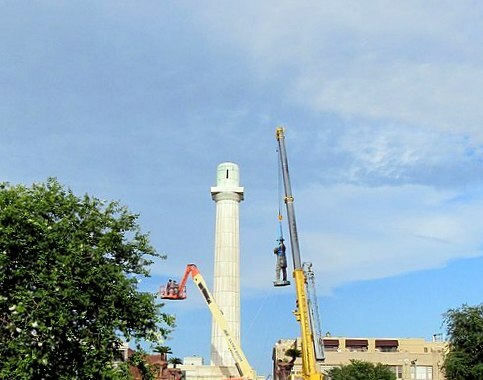 The building was insured, but the insurance money is not sufficient to cover the cost of rebuilding. We passed a good time with Sarah and Ron as they performed soul and blues music. The father/daughter duo make a great team. Both sing and play guitar, but, in the concert, Sarah was the main singer, with Ron as the main guitarist. How 'bout Sarah's sassy stance in the photo? Sarah sang the slow songs like "I Can't Help Falling in Love" and "To Love Somebody" beautifully, but I predict that her forte will be as a blues belter, and I told her so. The woman standing next to me seemed surprised at my comment. I think she didn't know what I was talking about, although she was a musician, but Sarah understood my words - or pretended she did - as the great compliment I meant them to be. I especially liked "Voodoo Shoppe" and "Mean" and... You know what? I liked all the songs, and it's hard for me to pick out favorites. Ron moonlights as a DJ and blogger for WWOZ, the New Orleans Jazz and Heritage Station. Ron is a regular Renaissance man, for in his priestly duties, he does simple but excellent liturgy, and he gives damned good sermons...and without notes. We are truly blessed to have him at St John. Below is the list of songs that Sarah and Ron performed. Yesterday the Friends for Traditional Louisiana Boat Building sponsored the first Bateaux de Bois Festival in Lockport, Louisiana, which was a grand success. The weather forecast showed an 80% chance of rain on Saturday. Friday was a total washout, and it seemed that Saturday would be more of the same. The organizers, including Grandpère, were mired in gloom. But Saturday morning arrived with patches of sunlight, and the weather outlook was much improved, although rain was still in the forecast but not until the afternoon. The rains didn't come until the around 1:30 pm, and by then a good many of the activities had already taken place. The museum building and several sturdy tents made it possible for people to stay around. When my son, daughter-in-law, and I arrived at the festival, and GP saw us, he choked up because he was so pleased with the number of people who showed up. He's quite emotional, but I was happy for him and the other organizers who worked so hard planning and making the festival come together. The purpose was to call attention to and raise funds for the Center for Traditional Louisiana Boat Building. Above is Grandpère being interviewed by a local television station. The two beautiful girls on the right are my granddaughter and the daughter of a friend of ours. Left is one of the bands that played at the festival. This one, as you see, is a one-man band. Couples doing a Cajun jitterbug dance pictured on the right. The festival raised several thousand dollars for the boat center, which operates on a shoestring. The museum is open on Tuesdays and Thursdays, staffed by Grandpère (Tom Butler) and one other faithful volunteer. 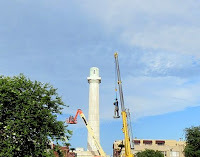 Click here for another post about the center. When the Vestry and School Board met Wednesday night I was so relieved and thrilled to learn that our precious chalices and patens were protected by the fire safe. The vestry had decided several months ago to purchase that safe to house the vessels. Martha Lynn Lewis led that effort, and I am so glad she did! The chalices are in perfect condition, although they'll need to be cleaned as there's a strong odor of smoke. For now, they are in safe keeping in a vault at South Louisiana Bank. Like a solitary flower in bloom on a battlefield, the mural of Jesus Christ, flanked by animals and smiling children, stands untouched amidst the charred remains of St. Matthews Episcopal Church. The Nov. 11 blaze destroyed the sanctuary and damaged part of the church school. At the eastern wall of the structure, the vivid colors of Houma artist Hans Geist’s 2009 mural stand in cheery contrast to the soot-stained rubble at Barrow and Belanger streets. Its colors are fresh as they were the day life was breathed into it. The mural, painted in 2009 by Geist with the help of children from the school, depicts Jesus with children and animals, below words from Matthew 19:14, “Let the little children come to me.” There has been no official determination made on whether the wall can be saved, although presumptions at St. Matthew’s are that it will have to go due to stability and safety issues. Hans Geist, 34, is a local artist who, with the help of students from St. Matthew’s Episcopal School, painted the mural on the side of the school. I am not alone in my hope that a way may be found to save the mural. That the mural survived unblemished could well be a symbol of hope and a reminder for the people of St. Matthew's Parish that God cares for all of the children, even God's grown-up children. Almighty God, we give thanks for the gift to the parishioners of St. Matthew's of many years of fellowship and worship in their beautiful church building. We ask you to give your people comfort, consolation, and the peace that passes understanding as they grieve the loss of their building. May the people of St. Matthew's remain bound together in love and obedience to you, ever mindful that a church is the gathering of its people to give you praise, honor, and glory. Give them strength and courage to continue in worship and fellowship, as they move forward to rebuild their building. We pray in the name of Jesus Christ our Lord, who lives and reigns with you, in the unity of the Holy Spirit, one God, now and forever. Amen. 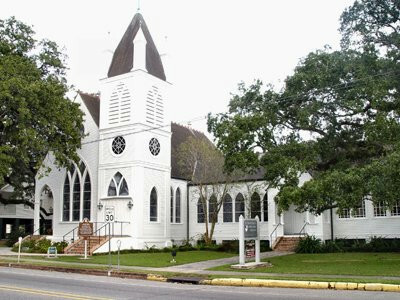 I bumped up my post on St. Matthew's in Houma to include the information below for those who may want to contribute. in the memo section of the check: 02-0195-2. Watch the slide show at WDSU. The Houma Fire Department officials are investigating an early-morning blaze that destroyed St. Matthew's Episcopal Church at the intersection of Barrow and Belanger Streets. The fire was reported around 3:41 a.m. Thursday. 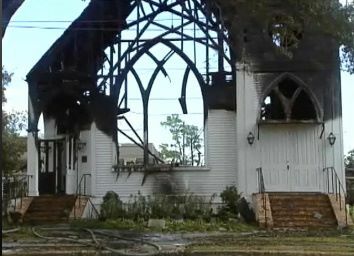 Officials say the church was completely engulfed in flames. Portions of the school and surrounding trees are reported to have been destroyed as well. Witnesses reported seeing flames up to 100 feet in the air. St. Matthew's Church is on The National Register of Historic Places. Pray for the rector and congregation of St. Matthew's and for the students and teachers at St. Matthew's school. Houma, Louisiana, is about 20 miles away from Thibodaux, where I live. I've attended activities at St. Matthew's on several occasions. How sad. St. Matthew's was a lovely old church. The full extent of the damage remains unclear, but damage was sustained at the church and the lower building of the school. Houma Fire Department District Chief Chris LeCompte said nobody was in the church or the school at the time. All that remains of St. Matthew's Episcopal Church in Houma at daybreak today. Members of the tight-knight congregation learned of the overnight fire by way of a flurry of phone calls made as the community awakened and encountered firefighters and flashing lights still surrounding the smoke-filled intersection. Some parishioners, teachers and school workers gathered nearby to watch firefighters work. Beulah Rodrigue, a church member for 70 years, said she was among a group of ladies who spent the past 11 years on needlepoint work that decorated the sanctuary's prayer kneelers. Rodrigue peered down Barrow Street this morning, toward the spot where the church's steeple once poked through the trees. Updates continue at the Daily Comet website. But church officials said they will rebuild the historic church. “The church will be rebuilt. We're not sure what it will look like, but the outpouring of support we've gotten from the community has been very encouraging and affirmative,” said the Reverend Craig Dalferes, pastor of St. Matthew's. He added that much remains uncertain in the immediate aftermath of the fire. Church administration will meet tonight to decide where the congregation will meet on Sunday. Dalferes said a number of community churches have called to offer St. Matthew's aid.